No, not Los Angeles. My sister, brother, and I spent the weekend in Lower Alabama with our mom. Mom celebrated her 85th birthday on January 19, and this was the weekend that the three of us could fly down to visit her. We had a wonderful time, but it went way too quickly! 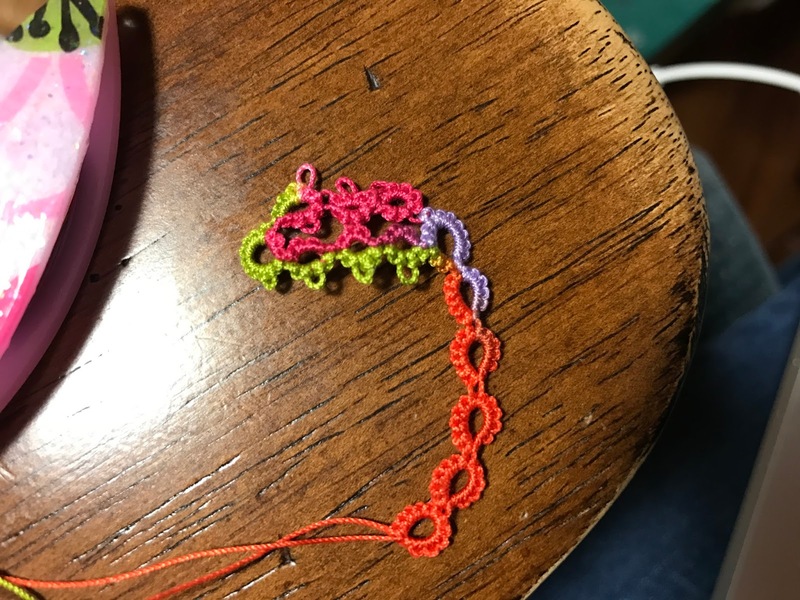 Before leaving on Friday, I spent time working with Mary Konior's Eightsome Reel from A Pattern Book of Tatting. Everything went fine with the first three motifs. However, I made so many mistakes on the fourth motif that I finally snipped it off and threw it away. I'll try again soon. I'd like to get this pattern down pat before starting on the runner for my sister-in-law. My first finished piece of tatting after returning from Alabama was another St. Patrick's Day themed Ice Drop. I don't add charms to all of my Ice Drops, but some of them just seem to fit! This morning I finished Day 8 of Jane's TIAS. Somehow, I did manage to add a little extra decorative loop between rings 21 and 22. I didn't notice it until this morning, and I wasn't about to retro-tat, so it has become a design element. That's my story, and I'm sticking to it! St. Patrick's Day will be here before we know it, so it's been easy to focus on greens! This one was finished early this morning, and I'm tempted to keep it for myself! I had fun playing with fabric again today, making a pin cushion and two more pocket tissue holders. I finished the Masquerade motif from Tatting with Visual Patterns by Mary Konior. I do like the way it turned out, but I got to thinking that maybe it's a bit too fiddly for a runner. Rather than dwell on the motif, I decided to tat another St. Patrick's Day Ice Drop. It's so much fun choosing charms for the backs of the Ice Drops. In my search for a motif that's less fiddly for my sister-in-law's runner, I tried this one from Jan Stawasz's Tatted Treasures. This is another contender for the runner, but I decided to keep searching. My next test tat was Eightsome Reel from Mary Konior's A Pattern Book of Tatting. I think I'll do a bit more searching and test tatting, but this might be the motif I choose. 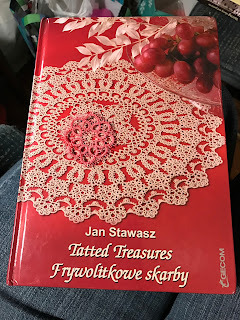 It's simple enough to remember (important for tatting multiple motifs), yet it has enough interest that I don't think I'd become bored with it. The best part of this project is looking through my books, one of my favorite pastimes! It's hard to believe that we're already on Day 6 of Jane's TIAS! I'm still not fond of split rings that have a picot on the second side, but I am getting better with them. I guess the old saying is true, practice makes perfect! I'm not much for Valentine's Day, but I do enjoy St. Patrick's Day. Yes, I am part Irish, but that's not the draw. I think it's the abundance of green, reminding us that spring is right around the corner. I found some cut St. Patrick's Day charms at JoAnn Fabrics last week, so I think I'll make use of them and my green threads for a bit. My sister-in-law asked if I would be willing to make a runner for her mantle. Mary Konior's Masquerade came to mind immediately! I'm practicing the pattern in size 20 Lizbeth #628, Salmon Med, because that was what was closest to me. 😊 However, the Linen Med is closer to what Karen would like. Needless to say, I'm having fun! This morning I saw that Jane is going to post the next part of the 2017 TIAS tomorrow, and I knew I had to play catch up! Day 4 introduced a new skill for me, the zig zag chain. I think I may have miscounted my stitches, but I'm happy that I've learned something new! Day 5 brought on more practice with split rings! I really do okay until I have to add picots to the second half of the split ring. Luckily, I didn't have to do that today! I started with pink thread, pink gem, pink beads, pink ribbon. Although pink is not my favorite color, I do like it! Next I changed the gem, beads, and ribbon to purple... not bad! I was always told that pink and red do not go together. I think I was told wrong! So, here are my three pink experiments, front view. And here's the back view. Pink can be fun! I love the glass gem in this Ice Drop! Although it's flat backed, it has the feathering in the middle that I remember in marbles. I really think I need to look for marbles! The crackling looks great in this Ice Drop. I think the simple front is the best for showing off the crackled gems. I chose an angel charm for the back of this Ice Drop. It just seems to fit! I wasn't really happy with the last couple of Ice Drops I tatted, so I decided to get back to the basics. The only change I made ti the basic pattern was to put a bead in place of the picot on the outer chain, and I added a bead to the center of the front rings. I let the crackled glass gem be the focus, and I am pleased with the way it turned out! Next I pulled out one of my favorite blue threads, Lizbeth #149. This time I stacked the 6/0 beads. I do like the look of the stacked beads! I think I prefer the Ice Drops without the charms, but I know that many people like them. This time I decided to have the charm on the back of the Ice Drop. Unfortunately, it hides the pretty flower pattern. I guess I'll have to do some more playing to decide what look I like the best! I received my newest shuttles from Rita Richmond of Shuttle by Design. These are Moonlit Shuttles that Rita has decorated. Tatters had been asking Rita for shuttles with embedded crochet hooks, and since this is something she is not able to accomplish with her handmade shuttles, she chose to offer decorated Moonlits. I think they turned out great! These aren't all mine. The purple one on the bottom is my friend Denise's, but the other four are all mine! Today I decided to try beach themed pony beads to decorate my newest Ice Drop. It looks okay, but I'm not thrilled with it. I joined the beads with a long picot, not thinking about the fact that there would be two threads across the back instead of one. I probably will abandon the idea of using these beads in tatting unless I can figure out a way to make them work. If you know of anything that would work, please let me know! My other experiment was with three seed beads instead of a picot at the center of each of the rings on the front. I was hoping the beads would enhance the crackled glass gem. I don't think it worked. I guess I'll just have to do some more experimenting! I subbed in the library today! It was like old home week. I greeted the kids as I always did, took attendance, monitored keyboarding skills, read, checked books in and out, shelved... I felt totally at home! While I thoroughly enjoyed myself today, I know that I made the right decision to retire at the end of last school year. I am TIRED! Before heading in to school this morning, I finished a Spinning Wheel glass mat. I have chosen the next project for my sewing students. We're going to make these cute little pocket tissue holders. They work up so quickly and easily! The directions are on YouTube. All you need is two pieces of fabric, one 5 1/2" x 7 1/2" and the other 5 1/2" x 6 1/2". The whole project can be done in less than 15 minutes... easy peasy! I only finished one Ice Drop today. Maybe I'll have time to make more tomorrow! Dave's getting close to finishing my kitchen countertop. All that's left to do is put the turntable back in place and seal the seams. I'd like a new dishwasher, but I think that will have to wait for a while. Tomorrow I start cleaning cabinets and putting things away. I think I may do a little rearranging while I"m at it! Yup! Another day got away from me, but at least I know why today. 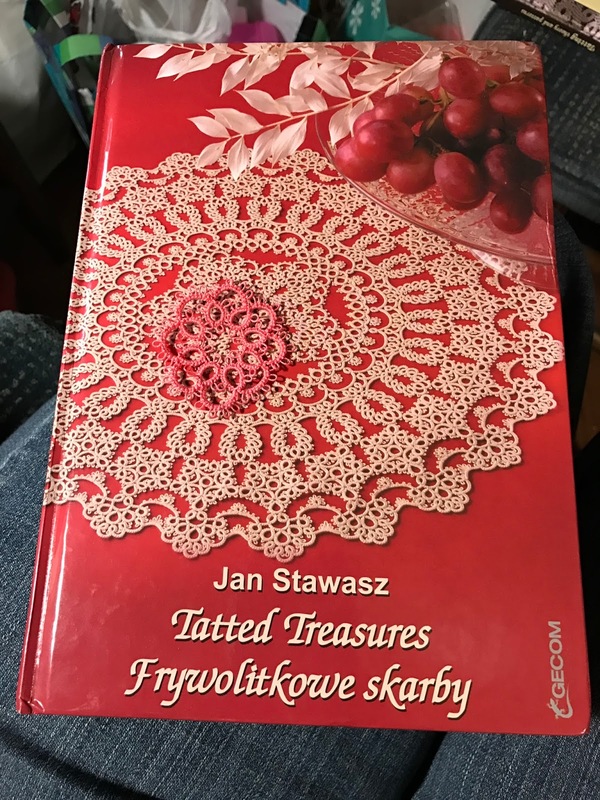 I spent quite a bit of time looking through tatting books for Ice Drop ideas. I also spent a lot of time looking up ideas for my sewing students. I do love research! So, I only finished one Ice Drop today. I'm okay with that, because today was a thoroughly enjoyable day! The day got away from me. I don't know how! At least I finished one Ice Drop! Day 3 of Jane's TIAS is up, and I did pretty well today. I will have to alter my original guess of this being a cheerleader. The appendage is simply in the wrong place. Now I'm guessing it's a jelly fish! While Dave worked industriously on the new kitchen countertop yesterday, I finished up laundry, snoozed in my chair, and tatted... yes, in that order! I know that 6/0 beads are too large for size 20 thread, yet I stubbornly keep trying. I do like the look of this Ice Drop, but the beads make the chain flop. I'll come up with a way to use this one, because it's one of my favorites. Where there's a will, there's a way! Next, I tried with just two beads. I really like the stacked look, and this one does not flop! Yesterday was costume measurement day for the high school play, Big Fish, which will take place in March. Over half the cast was missing, so I was only there for about an hour. Then I headed out to JoAnn Fabrics to look for yellow material for Mom. I succeeded in my mission, and then some! 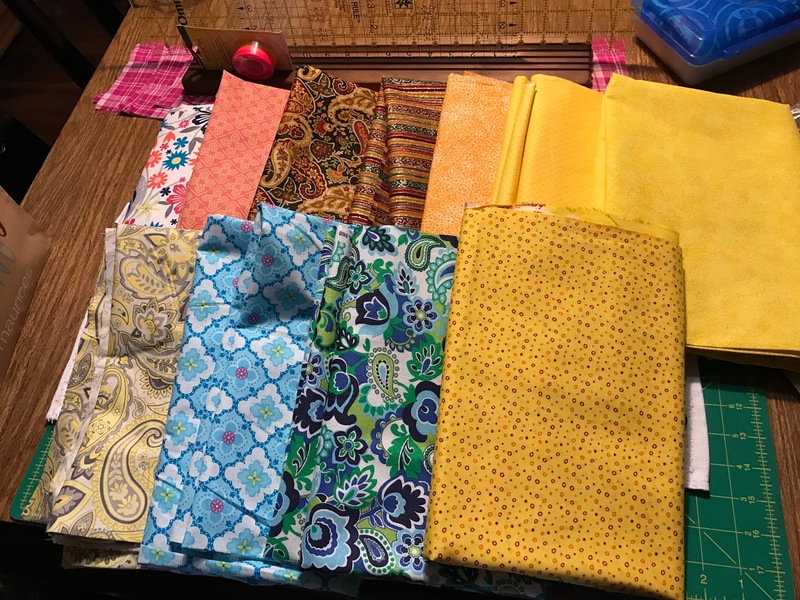 Fabric was 50% off, so I was not shy! I found some pretty pink glass gems at JoAnn's, so I decided to use one right away! This is the Ice Drop that helped me fall asleep in my chair last night. You'd think those vibrant colors would keep me awake! Day 2 of her 2017 TIAS is available here. I still think this is a cheerleader's skirt. Jane has been cheering me on to master split rings for years. I'd be fine if I could skip picots on the second side of the split ring. They lock up on me nearly every time. I'm pretty sure it should not take 25 minutes to tat 4 split rings!